Proceed on the main campus road, Coolidge Dr., which turns into McLaughlin at the sweeping curve. Follow the wide sweeping curve to the left. You'll almost immediately see a sign for Merrill College on your right. Take this first right up a very steep hill which will place you directly into the parking lot. You may park in any 'A' lot with an 'A' parking permit. 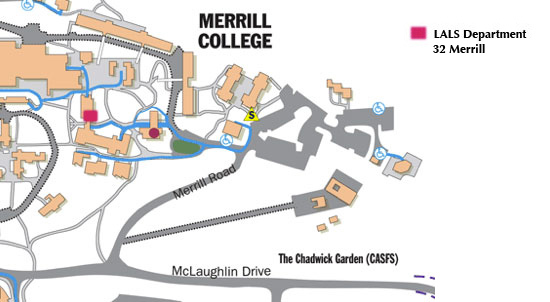 Walk back towards the main buildings and you'll find yourself at the Merrill College circle. The main office for the Latin American and Latino Studies Department is in room 32 of the Merrill Acad. Bld., Merrill College. This building is located by the Merrill College circle. Be sure to check out the Campus Map for comprehensive maps of the entire campus.